When I was a kid, you couldn’t tell me I didn’t have a green thumb. It started when my seventh-grade science teacher gave each of his students a piece of his chlorophytum comosum, better known as a spider plant. My spiky green portion was so small it fit in the palm of my hand. I became an expert at potting soil, watering practices, and plant food. By the time I went to college, Sylvia (yes, I named it) lived in a 18-inch pot in my parent’s family room. Mom sat her on the patio one warm spring day to catch some sunlight without accounting for the freezing overnight temperature. By the time I came home for spring break, Sylvia had gone on to glory. It’s been nearly 20 years (gee whiz!) since Sylvia, and I think she took my green thumb with her. I have yet to meet another plant that I can keep alive. There was Sylvia Jr., a small piece of the plant I took with me to college. It sat in a my dorm room window next to an African violet. The blinds in my room fell off the brackets and took them both out. My mom gave me some plant that was infested with fungus. For months, I painstakingly cleaned it with cotton swaps dipped in a solution of alcohol and water, until it too, succumbed. There are also a slew of devil’s ivy and aloe plants that have failed to thrive under my watch. When Mini Me was born, my best friend gave me a beautiful flowering plant to place outdoors. I sat it in the dining room, because our kitchen table was covered with bottles and new baby things. When I remembered the plant two weeks later, it was history. My mom asked me to keep her peace lily, and I sat it on the porch during Lil Ma’s birthday party. It burned in the hot July sun because I left it out there too long. Was this justice for Sylvia? Perhaps. I don’t know why I keep torturing myself and these poor plants. Yes, I do. I want to prove to myself that I can do it. I want to know that Sylvia was not a fluke, despite all the evidence to the contrary. 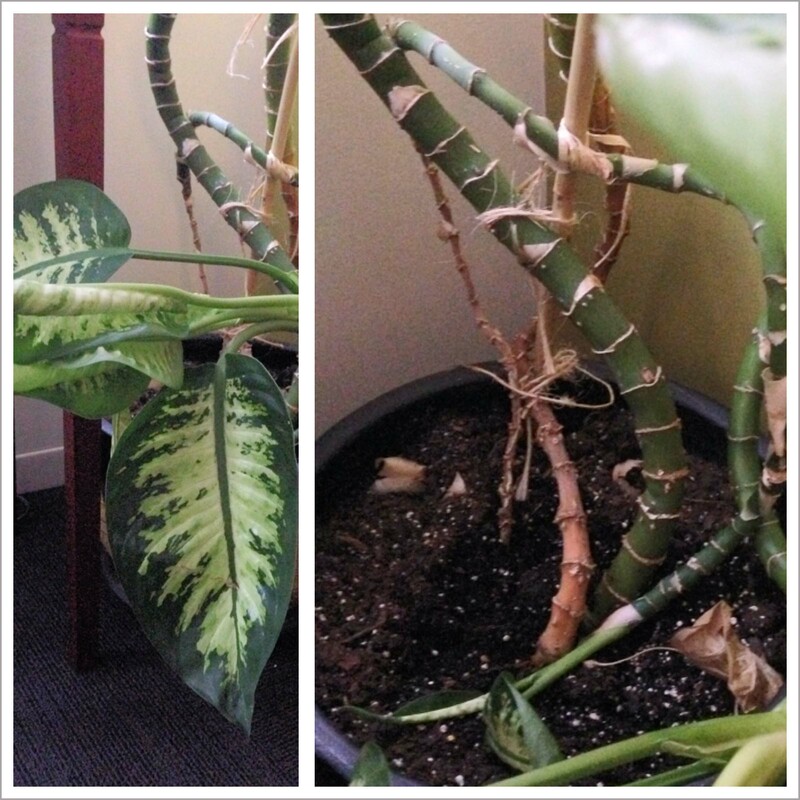 My latest victim is Bubba, a large plant I inherited from a coworker who left the agency. A three-month maternity leave (I forgot to ask someone to water him) and two office moves have taken their toll. This plant is dying from the bottom up. I consulted with a coworker who is certain that I can save him by cutting the good ends, placing them in water, and starting over. We’ll see. Thanks Don! Laughter is ok, I laughed as I was writing it out. Some would say that I’m still a little bitter about Sylvia, maybe I am, Lol. Thanks for stopping by! I don’t know if you meant this post to be humorous, but I sat here laughing aloud at the comment you made about your plant Sylvia and mom not accounting for overnight temperature. That would probably be something I’d be guilty of as well. Good luck bringing your current plant back to life! If I’m not mistaken, my mom would save eggs shells in a jar of water and water her plants to save them? Forgive me if I’m mistaken. Lol.